We're baaack! We've had a very pleasant and not-too-strenuous five days trekking in the Annapurna region, enjoying lush greenery, mossy rhododendron forest and above it all, the spectacular snow-covered Annapurna ranges. It was a pretty cushy excursion compared to our trek in Tibet - you wouldn't walk for more than an hour without coming to a tea house selling drinks, snacks, beer and food - and we slept in our own room every night (well, accompanied by a giant Nepali spider on the last night). It was all relatively low altitude and not too cold, so still haven't achieved that lean, mean tanned look I've been aiming for. Guzzling banana lassis and big bottles of Everest beer each night might have had something to do with that. Photos on their way once the internet connection in Pokhara achieves speeds a bit faster than carrier pigeon. 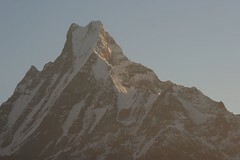 Sunrises and sunsets in the Annapurnas are pure magic, and this is a fine example. Imagine this colour tinting a mountain so majestic it takes your breath away. Unfortunately, I didn't quite catch that colour on the beautiful Machapucchare mountain (middle pic), but you get the idea. 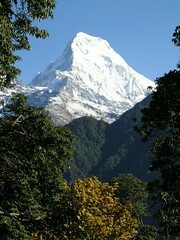 The bottom photo is of Annapurna South.